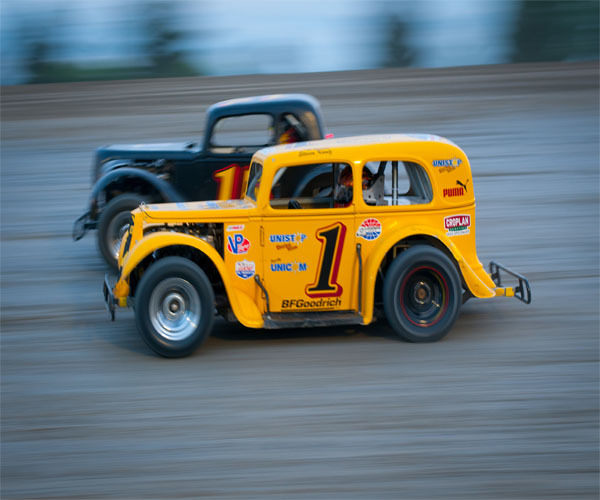 The Dacotah Speedway hosted night two of the INEX Legends Tour. INEX Legend drivers and fans came from all over the state to compete in this four day tour. Due to rain in the distance, the order of events was shaken up after intermission. 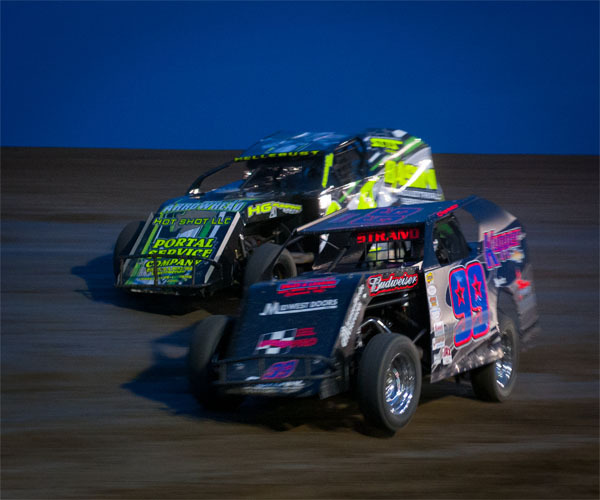 Two IMCA Modified concies started the night. Only the top four from each concy would transfer to the feature. Max, ND's Eric Fetzer started on the pole of concy number one but outside pole sitter Travis Olheiser grabbed the lead early. As Ohleiser led, Travis Peery of Yreka, California quickly raced his way through the field, battling Dave Aberle for second. A caution with five laps to go was the last thing Olheiser wanted to see as Peery dove low on the restart to take the lead. Peery led the final five laps to win the concy and transfer to the feature. Also transferring was second place Dave Aberle, Bryce Beck and Olheiser. In concy number two, Tylor Velo led from the pole. The clean air benefited Velo as he was able to hold off hard chargers like Travis Ulmer and Kody Scholpp on a series of cautions. On a restart with four laps to go, Ulmer got a great restart and battled Velo side by side for the lead. But when a caution in turn three brought out the fourth caution, Ulmer and Brad Hanson found themselves spun out under caution in turn two as well. The contact cut Ulmer's tire but Hanson was placed back in line in third place. Velo and second place Scholpp pulled away but as they raced for the concy win, they both drifted too high in turns three and four coming to the checkered flag, losing positions to Mike Hanson, Brad Hanson, Wyatt Dinius and Dallas Rice who would all transfer to the feature race. Wishek drivers Dana Welder and Brent Vetter pulled away early in the Hobby Stock feature. But it wasn't long before points leader Chad Hausauer crept into the top five after starting ninth. Hausauer continued to pick drivers off and close in on the leaders as Welder and Vetter battled side by side for the lead. A caution with seven laps to go allowed Vetter to steal the lead from Welder but Welder battled back and retook the lead with six laps to go. Vetter fell into third place Hausauer's clutches and the two drivers raced hard until Hausuaer slipped by with five laps to go. Hausauer quickly caught leader Wedler. A caution with three to go gave fourth place Scott Gartner the opportunity to get the feature win as he grabbed the lead on the restart. Gartner, Welder and Hausauer raced three wide for the lead until Hausauer shuffled into the lead. Hausauer led the final two laps to win his third feature victory of the season. 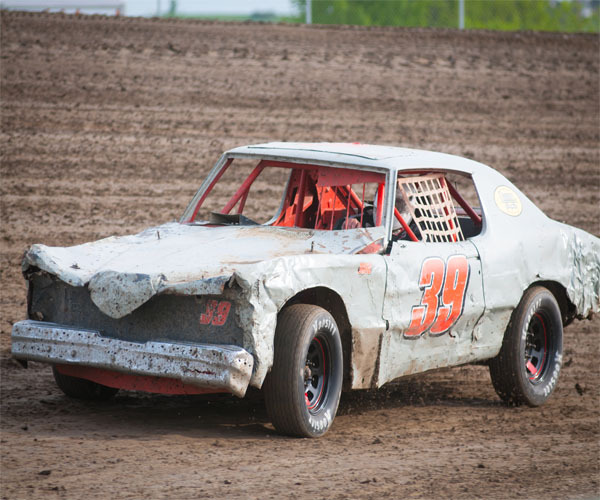 Gartner finished a close second ahead of Vetter, Welder and his brother John Gartner Jr.
Shane Williams of Minot won the opening night of the INEX Legends Tour in Wishek, ND and hoped to continue his hot streak in Mandan. Williams battled with Drew Papke for the lead in the start of the INEX Legends feature. As they raced side by side, it allowed third place Ivan Sailer to quickly close in on the leaders. Williams took the lead before a caution regrouped the field. Papke and Sailer battled for second on the restart as Williams continued to lead. Sailer finally managed to take second from Papke and challenged Williams for the lead. As they raced hard, veteran Steven Kuntz slowly crept in on the leaders, passing Papke for third. Kuntz the fastest car on track, passed Sailer for second with three laps to go and took the lead from Williams the following lap. Williams battled back but a caution on the final lap ended the race with Kuntz in the lead. Williams, who won the night before, finished second, ahead of pole sitter Papke, Sailer and Tom Wagner. Pole sitter Herb Bargmann lead the field to the green flag in the IMCA Modified feature. On a lap four restart, leader Bargmann fumbled on the start and lost several positions. Wilson grabbed the lead and tried to hold off a strong Robert Hellebust. They raced side by side for many laps until Hellebust took the lead on lap 12. A caution with ten laps go was the last thing Hellebust wanted to see. Third place Shawn Strand powered by Wilson for second on the restart and raced side by side with Hellebust for the lead. Strand took the lead with eight laps to go and pulled away. The final caution of the feature came with six to go, points leader Jeremy Keller had a impressive restart, moving from fifth to second in one lap. Keller battled with Strand for the feature win but Strand held on to win his second feature of the season, tying himself with Keller for the points standing lead. Mark Dahl finished third, Hellebust finished fourth and Wilson rounded out the top five. Travis Ulmer quickly grabbed the lead from rookie Hunter Domagala in the WISSOTA Street Stock feature. Domagala fell into the clutches of third place Brad Kadrmas and Kadrmas finally took the position on lap five. Kadrmas reeled in leader Ulmer with Domagala in toe. A caution allowed Domagala to retake second from Kadrmas but when Domagala got too high in turn four and spun, Kadrmas drove by for second. Kadrmas and Ulmer battled for the lead, side by side, allowing third place Jeremy Schmidt to close in. With five laps to go, it was a three car battle for the win until contact sent Schmidt's car spinning turn four. Ulmer and Kadrmas continued to race for the win on the restart, as they raced to the checkered flag, Ulmer's car bobbled out of turn four letting Kadrmas slip by down low. The two drivers raced side by side to the checkered flag, Kadrmas edging Ulmer at the line by inches. Zach Frederick finished third over Matt Brendel and Eric Harpole. 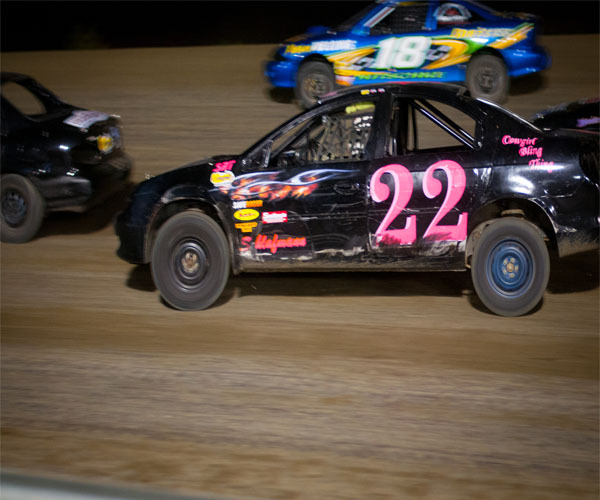 The IMCA Sport Compact feature finished the night. Alex Thompson started on the pole along side Cody Schulz. Thompson led the first two laps before Jamie Schlafmann took the lead and quickly pulled away. It was a race for second as Roehrich and Derek Nitschke battled hard for the position. With three laps to go, points leader Nitschke took second place where he would finish behind winner Schlafman. Roehrich finished third, Schulz and Thompson finished fourth and fifth respectively. 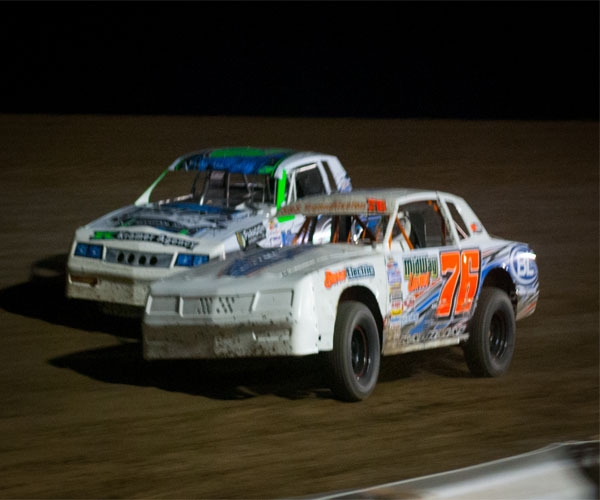 We'll be back in action on Friday, June 14th when it's Cenex and Mid-Season Championship night at Dacotah Speedway. On the card, IMCA Modifieds, Wissota Street Stocks, INEX Legends, Dacotah Speedway Hobby Stocks and IMCA Mach 1 Sport Compacts.